If you follow me on Instagram, you know that Keepin’ It Kind HQ is undergoing some major changes. It’s all good stuff, though! Pretty soon, I’m going to have a brand new kitchen to work in and I can’t wait to get in there and create some new recipes for you! What that also means is that right now, I don’t have access to a kitchen to create in. I actually have one recipe in the drafts, however, on second thought, I’m still not totally happy with it. Once I get my kitchen back, I’ll be able to test it for a third (and hopefully final) time. Until then, we’re doing a lot of making smoothies and avocado toast in the living room, doing dishes in our bathroom, and going out to dinner. 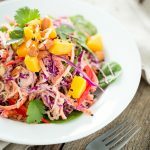 In the meantime, I wanted to share a summery, BBQ salad recipe with you! 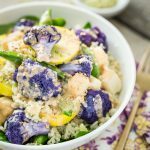 This BBQ Cauliflower Salad is actually from my book, But I Could Never Go Vegan! and it’s part of the chapter titled “Just thinking about salad makes me yawn.” The chapter is full of exciting, delicious, and hearty salads that would be hard for anyone to be bored with. This salad is one of my favorite salads from the book because it’s super hearty and filling, but doesn’t feel too heavy. If you have the time, I recommend making the Crispy Onion Rings from the book to top the salad (they really take this salad up a couple notches), but if you don’t, the salad is just as good with out them. If you don’t want to do a salad, this BBQ Cauliflower is amazing in a sandwich or taco too. Enjoy! You know those big BBQ sandwiches stuffed with onion rings? Imagine taking away the bread, dumping everything else into a bowl with some lettuce, and dousing it with ranch dressing. That’s what this salad is all about. Roasted cauliflower coated in Barbecue Sauce makes an unforgettable replacement for meat and is an instant favorite of all who try it (even cauliflower-phobes). 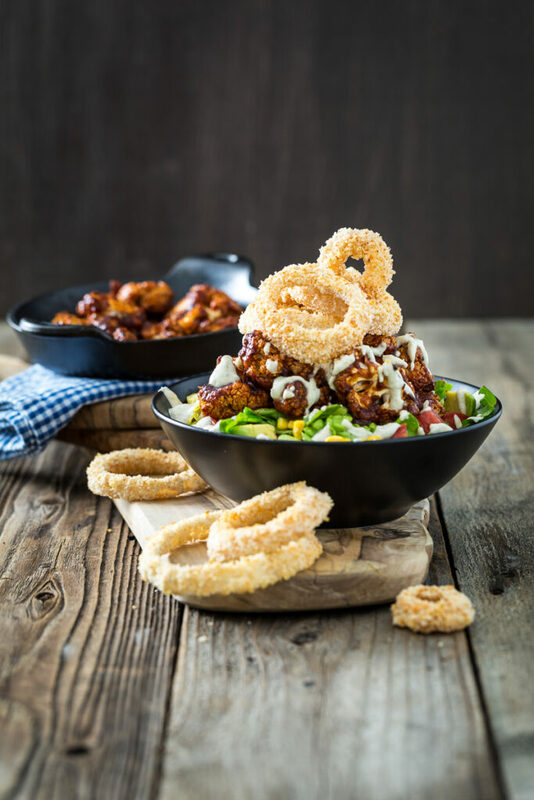 Topped with corn, tomatoes, and Crispy Baked Onion Rings this salad is for everyone who thinks a salad can’t be hearty, satisfying, and downright mouthwatering. All that, and it’s vegan! Preheat the oven to 400°F (200°C). Line a baking sheet with parchment paper or a silicone baking mat. Spread the cauliflower florets on the sheet. Lightly spray with olive oil. Drizzle with the liquid aminos and liquid smoke and sprinkle with the cumin, garlic powder, onion powder, paprika, salt, and pepper. Squeeze the lemon juice over them. Toss to fully coat each piece. Roast for 20 minutes, tossing once halfway through to ensure even cooking. Mix the Barbecue Sauce and cornstarch in a cup. After 20 minutes, remove the cauliflower from the oven, add the sauce, and toss. Bake 5 to 10 minutes more, until most of the BBQ sauce has dried. Toss together the greens, corn, tomatoes, and avocado in a bowl. 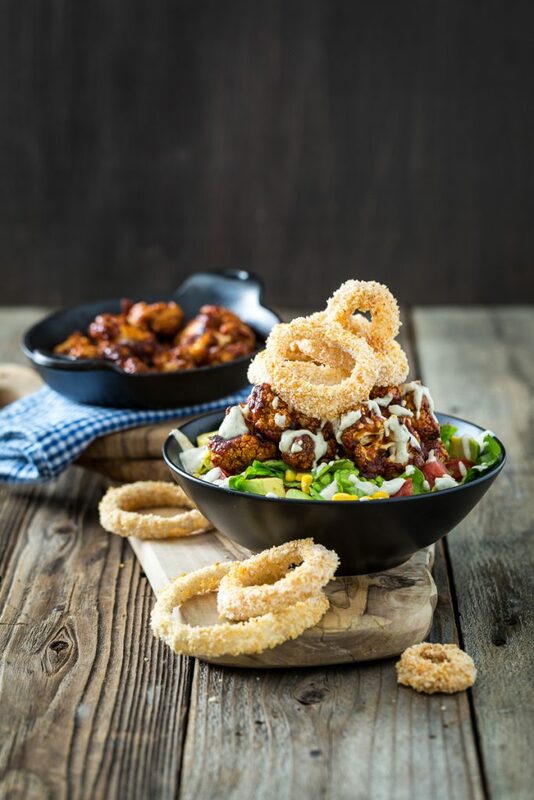 Divide the salad among four bowls, top with the BBQ cauliflower, drizzle with the dressing, and top with the onion rings. Serve immediately. Have you bought my book? I hope you’re enjoying it as much as we do! If you love it, would you mind taking a moment to leave a review on Amazon? I would be so grateful! If you’ve already left a review- thank you so much!!! 50 Awesome Vegan Pizzas Orange Ginger Pan-Fried Tofu Bowl with Yogurt Tahini Sauce + A GIVEAWAY! 15 Responses to "BBQ Cauliflower Salad with Zesty Ranch Dressing"
This sounds delicious. And I immediately recognized this photo from the cover of Vegan Life earlier this year! This looks good! I just got your book in the mail yesterday, I can’t wait to start cooking from it. 🙂 It is winter here at the moment though, so I am heading straight for the hot and hearty recipes! Susan recently posted…USA 2015 Part 2: VidaVeganCon Kicks Off! This is one of my favourite recipes from you book! It’s so delicious! Living in a construction zone is tough! The new kitchen is looking beautiful. Thanks for sharing such a beautiful recipe from your book! Coincidence! Just last night I made the cauliflower portion of this recipe (from your cookbook). I put it on a roll pulled-pork style and added mustard, leafy greens and relish. Amazing. Have made the salad (without the onion rings) about three times so far–delicious. I’ve been a vegan for a decade; your cookbook has been an invigorating addition amidst other treasured books from Isa Chandra Moscowitz, Dreena Burton, and Robin Robertson. What a gem you’ve created! I found your blog after book purchase and will be forever grateful to you for teaching me how to whir up hearts of palm in the Cuisinart as a substitute for cheese (hearts of palm quesadillas are a new coveted diet staple). Also amazing? Your gluten-free flatbread recipe (my son and husband have celiac–those flatbreads are game changers–delicious canvasses for falafel and pizza toppings). Sorry about the longwinded comment. Just wanted to share my gratitude with you! Thanks for all the time you pour into sharing your creative cooking with us. Keep up keepinitkind! Thank you so much for your sweet, kind words, Stacey! I’m so happy you’ve been pleased with the recipes! This looks wonderful and fun. 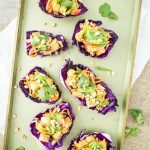 I’ve been vegan for over 5 years now, but my husband is starting to get more serious about being vegan and I’ve been trying to find more creative recipes for him. Thanks! Salads are great anytime, but when someone really knows how to put a salad together, oh man am I excited! Salads like this one can really convert the salad-haters out there for sure! This cauliflower sounds so delicious! I might mix it up with some romanesco too — mostly because I have some kicking around from last week’s CSA box. 🙂 Fantastic! 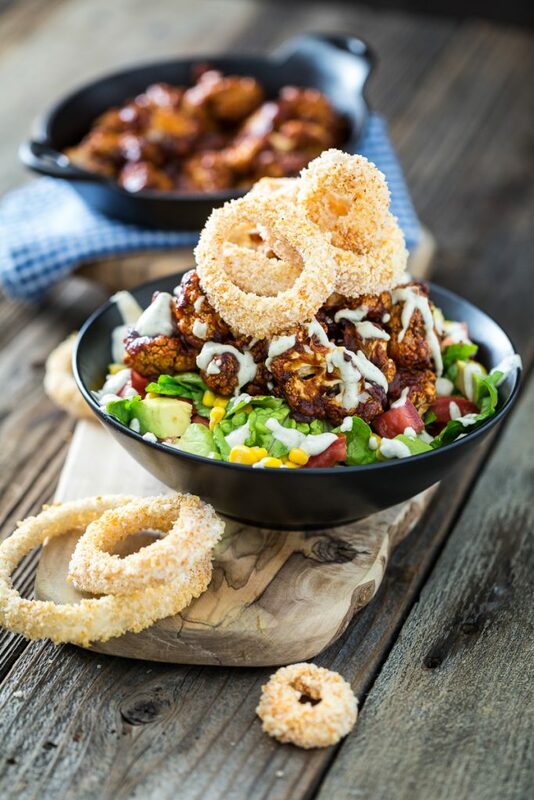 This salad looks incredible, especially with that BBQ cauliflower. We have never cooked with liquid smoke, any special tips? There’s not really any special tips- it’s just a liquid that adds a great smoky flavor. I love it! I had my kitchen renovated last year– and know exactly what you mean about tons of smoothies 🙂 For the past month, we’ve been having one of our bathrooms redone, and new built in cabinets installed, and the whole house repainted, and even though I still have my kitchen, everything is such chaos I’m back to the smoothie routine– too busy cleaning everything else to cook and clean! Good luck getting that finished up! I am loving the look of this salad.. and those crispy onions especially! This was wonderful! I made the ranch dressing and barbecue sauce in advance, so the night-of-dinner prep time wasn’t that long. The textures and flavors came together wonderfully, and the recipe makes four good-sized salads. Thank you!